Discover authentic Puerto Rican cuisine nestled in the heart of Spanish Harlem. Enjoy rice and pigeon peas or should I say arroz con gandules – full of flavor; each bite takes your mind to a small town in Old San Juan which hosts a restaurant that is iconic to the town where the cooks use traditional, local ingredients and the food is prepared in a traditional manner. Pastelito discs from the supermarket is a no-no. Hand-prepared and hand-rolled dough is all they use. There is no such thing as store-bought sofrito. All of the freshest ingredients are used including cilantro, onions, tomatoes, and garlic. You will find those same traditional flavors at La Fonda. 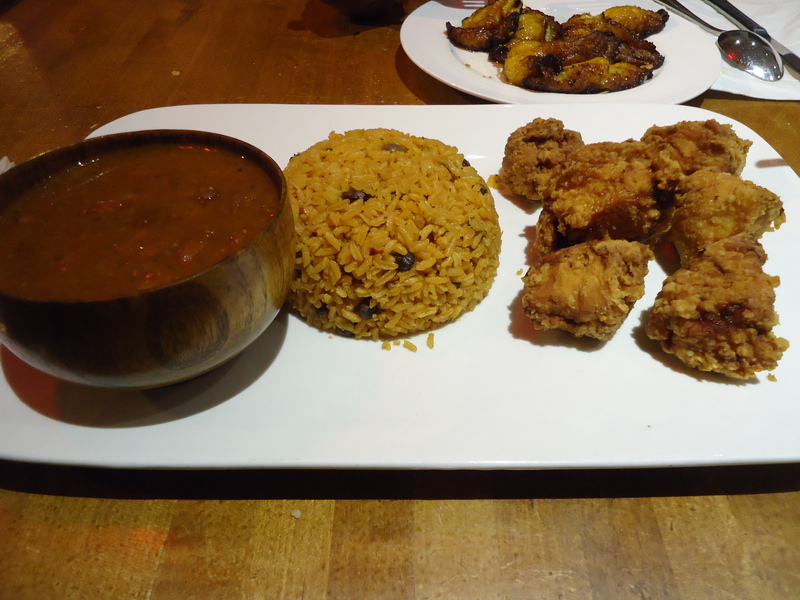 It’s not a New Yoriquen restaurant; it is every bit of down home Puerto Rican cuisine. The décor of the restaurant is unique. The layout is horseshoe-shaped. There are two entrances to the restaurant. On one side of the restaurant is a bar, and an eating area on the other. The food takes quite some time to get to the table. It is far from fast food. While you’re waiting for your food, take in the sounds of Latin Jazz. Beautiful Art work covers the exposed brick walls. The restaurant has less of a Latin design and more of an Afro Latin look with a modern twists specifically with the light fixtures. A communal table centers an area of the restaurant, which seats large families and groups. The Latin community embodies the idea of family especially on a large-scale. As I am dating a Puerto Rican, I also notice that they welcome all as family and identify individuals that are close to them as family even if there is no blood relation. You feel the same warmth and welcoming when you enter the restaurant. The food at La Fonda is amazing. Outside of the food, the Puerto Rican culture and the history of Spanish Harlem is just as exciting to uncover. What makes New York City so beautiful is the diversity in all cultures. Learning about different cultures and ethnicities is a highlight of my New York City addiction. You don’t have to fly to Puerto Rico to embrace the culture. Visit Spanish Harlem, and revel in the sounds of salsa; enjoy a plate of chicharron de pollo, share a creamy dessert plate of flan with a friend as you chat over café con leche. La Fonda is a Latin experience that all New Yorkers should experience. I love this restaurant and as a regular dining-outer, the cost of the food was shocking. We ate so much and our bill was so low. Compared to Midtown and Upper East Side prices, where you pay a lot and there is no guarantee you will enjoy the food, at La Fonda, good taste is guaranteed at a great price In my truest views, the New York City experience as a whole is priceless. Categories: Caribbean/Caribe, Family, Food Wine and Spirits, Miss Metropolitan Junkie, Miss MJ xoxo, Urban Aristocrats, What's Hot in N.Y.C.